Tehuitzingo Deli & Grocery Inc. When meeting up with Michael Melamedoff, writer and director of "Weakness", there was no question that we would go for tacos. Michael suggested the "secret taco deli" on 10th Ave at 47th street and the mystery of the place enticed me. Since I started blogging many people have recommended a number of taco joints worthy of my review and many of these places are in Queens, NY. I (unfortunately) do not make it out to Queens very often, but Saturday night was special. To honor the World Champion 1969 Mets, the 2009 Mets had a pre-game celebration at Citi Field (the new Shea Stadium). Being a life-long Mets fan I was extremely excited to have a look at the team from way back when, but also the real perk lay in Citi Field's new dining concourse. Hot dogs, pretzels, and cotton candy are still available at Citi Field, but you can also opt for Shake Shack, Blue Smoke, Box Frites, and many more higher-end options. 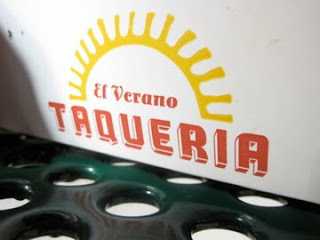 My favorite: El VeranoTaqueria. Eating tacos at a baseball game. My Taco House experience left me very unsatisfied in the taco world, so the following day I was in search of redemption. The outside of The Original California Taqueria was enticing, very authentic looking. I figured anything was better than the Taco House disaster. The Taco House is a fast-food-Chinese-restaurant-turned-taqueria. Not a good combination. I took a chance at The Taco House. Fooled by the letter posted in the storefront window by a customer praising the service and food quality, and compelled by an intense taco craving, I settled for a Taco House lunch on Wednesday. I wish I had curbed my craving one more day. The chicken was dry and much too salty. The hard taco shell (I should have known that having only hard taco shells was a bad sign) was stale. The tomato and lettuce did not improve the situation; they made the stale shell into a soggy mess. 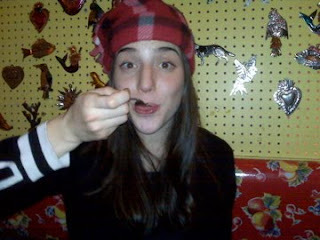 I could continue describing the horrendous taco, however I will spare myself the memory. My hunger pushed me through to finish the taco, but not with pleasure. And the guacamole was far from the proper shade of green. DO NOT eat at Taco House. I do not know if they have any loyal customers, but I will not be one of them. I frequent Burrito Box on a regular basis. It's fast, (usually) delicious, and won't leave a huge dent in your wallet. I have been looking forward to my most recent trip to Burrito Box because I could finally blog about tacos I rely on. I walked by Burrito Box at 2pm (thinking I had missed the lunch crowd) and was shocked to see a line out the door. Unwilling to wait, I wandered around to build up my appetite and returned to a much calmer Burrito Box at 2:45. To veer away from my usual I ordered the chili con carne tacos, two tacos per order. Unfortunately, Burrito Box only has hard corn tortillas for their tacos (the only soft tortillas are flour). I've learned to live with the crispy taco shells because the filling is just so good, but yesterday was a different story. Yes, I am obsessed with tacos. But I also love all Mexican food, particularly because they seem to use the same ingredients rearranged in different ways to produce entirely different flavors. Also, the abundant use of corn (i.e. corn tortillas) makes it easy for me to eat gluten-free. Saturday night in Larchmont, NY and I'm craving Mexican food. My mom, sister and I decide to upgrade from our local taco stand to Boxcar Cantina, an authentic Northern New Mexican restaurant, in Greenwich (20 minutes outside Larchmont). There were only two taco options on the menu, hard and soft tacos. To maintain continuity with my taco travels, I went for the soft tacos (requesting corn tortillas to keep it gluten-free). The soft taco plate came with three tacos--chicken, pork, and shrimp. A quick side note -- a few weeks ago I never would have ordered such a dish. I did not like shrimp and pork gave me the heebeegeebees. However, in San Francisco, with Chase and his family, I discovered I indeed DO like shrimp and pork tacos can be quite enjoyable. So this soft taco plate fulfilled my love of tacos and my new food adventures. While visiting my friend, Chase, in the Bay Area, I knew it was crucial to get a taste of West coast tacos. Unwilling to settle for just any taco, we crossed the Golden Gate bridge returning from our adventure in Marin and back in the city of San Francisco we ventured to GordoTaqueria, a little taco shop nestled on a block of banks, Japanese restaurants and, of course, Starbucks. Walking into Gordo you get the feeling of authenticity. The smell of beans, cheese, and deliciously cooked meat is overwhelming and your mouth starts watering. We waited on line for about 5 minutes observing the behind counter expertise of crafting a burrito for the patrons in front of us. Then our turn! Chase was more adventurous than I and ordered (in Spanish) un taco decarnitas tacos (pulled pork). For consistency purposes I went with pollo (chicken).